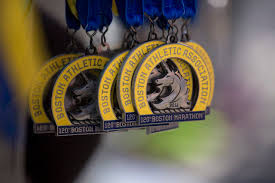 As things have turned out, the main goal for the winter season training will be for Boston Marathon, taking place April 16th 2018. That is 20 weeks from today, and that makes today the day when my official training program starts for the winter. I do have the intent to also do some triathlon competitions as well in 2018 – most importantly the 2018 Iron Man 70.3 World Championships in South Africa in September. This means that I will keep up in some form or shape the training in swimming and biking during the winter to not loose too much capacity in these areas. Last year I used winter to mainly build up my biking strength and work on my swimming, while maintaining a steady run program. As I will have a slightly different focus for the early season with the marathon being clearly an A-race, I will make some adjustments in the set-up. Training program and new shoes to start off good! Last winter my base week training had nine sessions – three runs, three swimming and three bike sessions. The program I will follow requires more running, so the overall plan right now is to do four or five runs per week, and keep two bike and swim sessions, keeping overall volume the same as last year (ten to twelve hours per week during high volume weeks). The good thing is that the Boston Marathon is fairly early in the season, which means that I can already early April start tapering down the running volumes and start increasing the bike training. It will be interesting to see how this shift will play out in my strengths and weaknesses in triathlon, I have so far been fairly equal in all three disciplies. In the end, I do believe that running is the key strength you need in triathlon – be a good and strong runner and you can make up tremendous amount of time and placements as other competitors fade late in the triathlon runs, especially on the longer distances. With that in mind, I think that the tough marathon program will help out in my triathlon development later during the season. In 2017 I ran the Stockholm Marathon in early June. Training for that I used parts of a 3:30 program where I mainly focused on the long runs and the set-up of those. I only did three runs per week, but with the overall training including swimming and biking, I built up a strong enough physique to run the marathon in 3:12:47, just below my goal of 3:15 this year. The goal for Boston Marathon will be to run it on 3:10 or faster. Now Boston Marathon is a point-to-point race and overall downhill, so it requires some specific training on downhill running. Weather can also play a major factor as temperature can vary widely so early in spring, as well as that in the point-to-point course wind can help you a lot, or wreck it all. But I have no power over weather, so as always it is important to make the most of what you can have control over – your training and preparation for the race. In order to prepare, I have this time decided to follow a 3:15 training program, where I will increase speed a little to simulate the 7 s/km faster pace I aim for compared to the program. The base program I subscribe to is developed by Swedish marathon star Anders Szalkai, who has programs developed from 3:00 finish times and upwards. Looking at the program I am still scared: it has 93 sessions totaling 1300km in 20 weeks – that is average 4.5 sessions per week and 65km/week. Previously I have not gone above 50km/week average running, so this is a fairly large increase for me. It is not only the sheer volume that is daunting, but the fact that the entire program will be done during the Swedish winter – training for Stockholm Marathon you have all of the spring months of April and May to do the main bulk of the long runs, a beautiful and light period in Sweden. Running my 24-37km long runs now during November-March for sure will be a challenge! Apart from the long runs, the base program has 1-2 quality sessions (intervals or threshold runs) and 2 additional easy run days that mainly builds volume. Taking into account the triathlon training mix I need, I will scale back the running slightly and average no more than four runs per week average, and most likely ending up on an average of 55-60km/week. This should also decrease the risk of injury coming from overtraining as my calves are still sensitive to too much volume of running. Good thing is that I have managed to keep up the running during October and November, so I have a very solid base to stand on and start off the program with. I will take out one easy run per week and exchange for a bike session, and any second rest day in the running program will also be dedicated for biking. Swimming – as it does not involve so much leg work out, will be spread out on suitable easy running/bike days. Without a tough program, but that is the life of a triathlete and something I enjoy. The Boston Marathon is famous for its course profile combining early downhill running followed by undulating and rolling terrain. As such, it is recommended to include downhill running training in your program. Here I will take the BAA suggested hill interval sessions and include those in my program – they consist of 400-800m long hill intervals where you not only run uphill, but rest on the top and then run downhill as well. The quads need to get beaten into submission ahead of the Boston Marathon! I will substitute some suggested interval sessions in the program for these downhill intervals. One additional item that gets incorporated into the training by following a program is the suggested strength, technique and stretching exercises. I will try and follow these better this year in order to further build up running strength and speed. With the experience of the marathon training ahead of Stockholm Marathon in 2017, I hope that a solid running program including all elements required – speed, volume & distance, strength, technique & coordination, stretching and downhill training – will make my goal of lowering my personal best with 3 minutes not too large of a hurdle to manage. Now I only have to get to work and execute, while staying injury free! It feels good that today – the first training day – is a rest day. There will only be about 19 more of those until it is time to race!